Here is another one of my fabulous vintage dress finds! This dress is fun because it was one of those that looked a little questionable on the hanger but after I tried it on I realized that it really was pretty cute. I added a high waisted gold stretchy belt, (also bought at a thrift store last year) which help disguise the somewhat "bag-like" look that was going on. 3. It only cost me $1.50!!! I hope everyone did something fun this weekend, I followed through with my plan and took a trip to the lake with my husband and 18 month old....we had a blast! This dress is so cute! I love dresses with pockets! What a great find for only $1.50! Umm hello you are STUNNING!! Did you go darker with your hair?..love it. What a fantastic find!! Love the gold belt paired with it and $1.50?? STEAL! 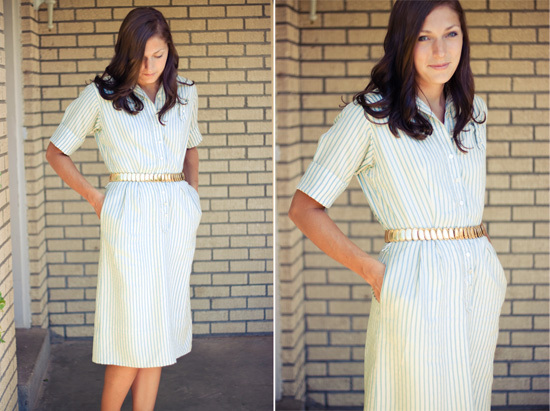 The dress looks fabulous with that belt - what a great find! Love this dress! What a steal!! And pockets? Hello, mom's best friend :) And your belt is perfect. You look amazing! Nice find Andrea! I found a red dress at DI this weekend for $4! I got so many compliments on it at church...definitely a keeper! You have a real eye for fashion. Maybe you can help me out. My vintage clothing does not look like that.